HYDERABAD: Workers of the Awami Tehreek (AT) took out a protest rally against capitalism and war mania from the Old Campus of University of Sindh to the Hyderabad Press Club on Friday. Protesters, carrying placard and banners, shouted slogans against both capitalism and war mania which according to them, gifted hunger, poor economic condition, robbery, unemployment, crime to people in the world where the system existed. Speakers said that the capitalists forced people in the west to lead their lives under the system. They said Europeans got up against the system as it failed to generate jobs, facilitate people, provide good businesses et cetera. They said that in America, Africa, Europe, and Asia, there was a revolt against the system. 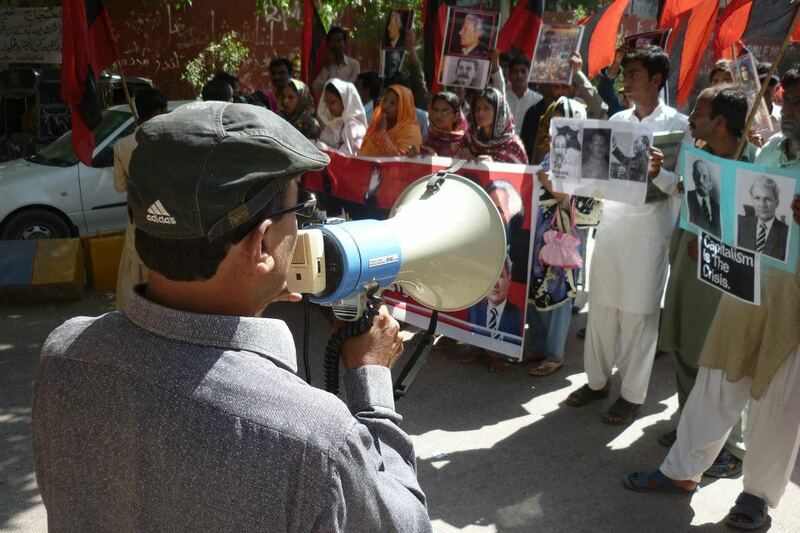 HYDERABAD, Oct 21: Awami Tehreek activists, including women, took out a procession from the Sindh University old campus to the press club here on Friday to express solidarity with the Occupy Wall Street campaign and the protests triggered by it around the world. 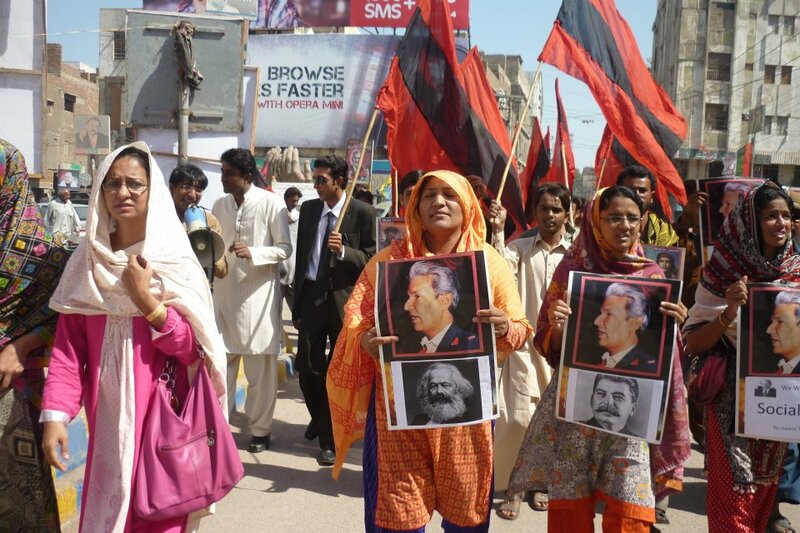 Carrying the portraits of iconoclast philosopher Carl Marx, revolutionary leaders Vladimir Lenin, Mao Zedong and AT leader Rasool Bux Palijo, they were raising slogans against the imperialist system and in favour of workers’ revolution and what they called the oppressed nations. Speaking on the occasion, party leaders Javed Rajpar, Ms Husna Rahujo, Ms Shaheen Khaskheli and others said that working class of the world had launched a relentless struggle against international imperialism. 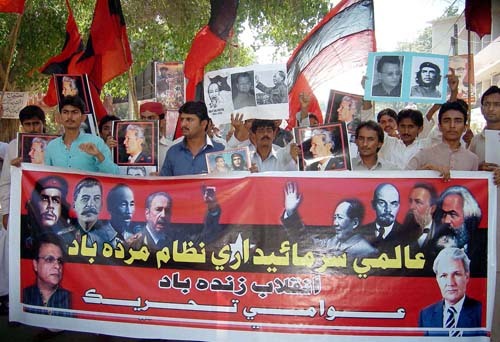 They expressed the hope that capitalist system which had a history of 500 years would be uprooted throughout the world. They held the capitalist system responsible for hunger, unemployment, wars, economic loot and plunder and proliferation of weapons. 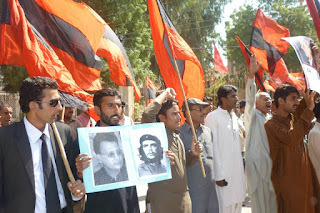 They said that those who had celebrated the downfall of socialism in Soviet Union should now look towards the Wall Street.SEMINAR: Speakers at a seminar on “War against privatization, unemployment and price hike”, organised by the Pakistan Trade Union Defence Campaign (PTUDC), have said that the Privatisation Commission should be dissolved and the decision to privatise powerhouses should be rescinded. They said that the working class was being exploited by the government through privatisation, adding that national enterprises were being disposed of at a pittance. They said that price hike, unemployment and poverty were increasing with each passing day and it had become difficult for the workers to arrange even two square meals for their families. On the other hand, they said, the rulers were living in luxury. However, they said, capitalist system was fast losing its ground not only in Pakistan but throughout the world. They said the working class had finally awakened in the USA, Europe and Middle East and they were struggling to bring about a socialist revolution throughout the world. They said that poverty, unemployment and hunger could be eliminated only through a socialist revolution. 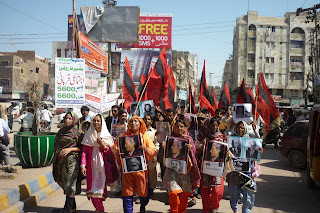 They condemned violent police action against lady health workers in Lahore and demanded that child labour be declared a criminal offence.